And yet, by 2009, Seeger was apparently considered normalized (or perhaps domesticated) enough by elite opinion to be featured at the official inauguration concert. But Seeger had a trick up his sleeve that day. After singing their familiar way from “the ribbon of highway” to “the Gulf Stream waters,” the trio launched into three relatively unknown (and often censored) verses, with Seeger reciting each line loud and clear, just before the others chimed in. They sang about hungry people huddled outside the relief office; they attacked the very concept of private property; they set out on the “freedom highway,” and defied anyone to stop them. In other words, they seized upon the radical message of “This Land Is Your Land” and rehabilitated it in front of what was probably the largest single audience the song has ever had. Now, to the cynical eye, this was just one more instance in the long, sad, and inevitable co-optation of Woody Guthrie, however good the intentions of the performers. Even if the radical core of “This Land Is Your Land” was restored, did it make any difference? Was there not something perverse in placing this song at the center of such a garish celebration of state power? Was this not, as Gramsci might have said, just the old trick of capitalist hegemony re-articulating itself as easily containable (and commodifiable) resistance? To put it simply, was this not a sellout on the grandest scale imaginable? Perhaps. But to any extent that this is true, the performance of “This Land Is Your Land” was still remarkably subversive, as a symbolic act and as a form of agitation. Consider the basic function of the inauguration concert: it was a typically slick piece of nationalist propaganda, intended to project the myths of American exceptionalism and obscure real divisions of social power behind star-spangled appeals to patriotic unity. Seeger and company interrupted this narrative with an image of capitalism’s dispossessed, the people with hungry stomachs in the richest nation in the world. Even more astoundingly, they depicted private property not as some god-given “right” but as a social relation—an unjust one that should be swept away by cooperative ownership. And then there’s the “freedom highway.” A fairly innocuous image, but knowing anything about Woody Guthrie and his politics, that highway could have only meant one thing: the road to socialism. As Will Kaufman argues in his wonderful and uncompromising book, Woody Guthrie, American Radical, the folksinger was not driven by some abstract commitment to justice alone, but by the vision of a cooperative planned economy, one that could meet people’s needs directly and foster meaningful social, economic, and racial equality. He threw himself into the struggle for socialism, and insisted that “I never sing nor play one single word or note that is not for the help of the working classes to know more, feel better, rise up, and to own and control this world that they have built” (88). Of course, Pete Seeger would have known that—he and Guthrie, after all, had been friends, collaborators, and comrades. Not that Guthrie’s radicalism was ever much of a secret. From his first radio gigs at KFVD in Los Angeles, Guthrie melded the “hillbilly” music of his native Oklahoma with an increasingly sharp critique of social injustices, particularly those suffered by fellow “Okies” whom the Dust Bowl had transformed into a migrant labor force. He attacked California’s repressive “immigration blockade” in the song “Do-Re-Mi” and wrote movingly about conditions in local Hoovervilles. Soon he was writing a regular column, “Woody Sez,” for the People’s World and later the Daily Worker, both published by the Communist Party USA. When Guthrie cut his first record, Dust Bowl Ballads, for RCA Victor, he told Daily Worker readers that “I seem to have been born a shade pink, and didn’t have to read many books to be a proletariat, and you can guess that when you hear the records, as I’m sure Victor [has] never done a more radical album” (42). Guthrie was, in effect, carving out a space in the popular music industry for openly radical artists, paving the way for the likes of Phil Ochs, the Clash, the Coup, and countless others that have appeared in ensuing decades. While Guthrie’s political commitment would have been apparent to anyone paying attention, Kaufman argues that Guthrie developed a richer—and much more militant—radical consciousness than his recorded output suggests. For instance, the final verse of Guthrie’s early ballad “Jesus Christ” reads: “When the love of the poor shall turn to hate/When the patience of the workers gives away;/‘Twould be better for you rich if you’d never been born’/For you have laid Jesus Christ in his grave” (43). Not surprisingly, the verse exists only on paper; no known recording of Guthrie singing it exists. Forget turning the other cheek—here Guthrie imagines the violence inherent to capitalism being turned back on the ruling class in a grim vision of class warfare. This trope ran through all of Guthrie’s work, and while he was eager to celebrate, and often romanticized, the lives of working people, Guthrie also sang about their revolutionary potential to transform society. Over time, Guthrie became closer to Communist Party activists and began a serious but frustrated study of Marxism. He had trouble with the more theoretical material, and once scribbled a note in his copy of Lenin’s Theory of the Agrarian Question, wishing that he could “make all the thoughts of Marx and Engels and Lenin and Stalin and Wilkie and Roosevelt and Earl Browder fly down and roost in my brain.” But despite his difficulties, Guthrie was committed to infusing his work with Marx’s critique of political economy—in his copy of Capital, he wrote, “Will memorize contents in a week or so.…I’d like to try to write all of these things down in short words” (19). It is doubtful that Guthrie was able to memorize Capital in “a week or so,” but the point is that, despite the aw-shucks persona, he took his political learning seriously and was moving toward a sophisticated analysis of social reality. More than simply portraying the squalor and brutality of life under capitalism, Guthrie sought to expose the real dynamics of the system and give voice to the experiences of all sorts of human beings caught up in its vast productive apparatus. For the most part, these were voices coming from the bottom of society, otherwise drowned out by the hum of factory machinery and the roar of the dust storms, the police barking orders and politicians making promises. Through his songs, Guthrie let these voices be heard—and demanded that we listen. Woody Guthrie, American Radical is neither biography nor hagiography. Instead, Kaufman explores the political content of Guthrie’s work and personal identity in a way that anyone already familiar with the basic story of his life will find immensely gratifying. While this book does not avoid portraying Guthrie with all his flaws—his self-righteousness, his casual use and abandonment of women, his personal fondness for Stalin, to name a few—Kaufman is no iconoclast. Rather, he admires Guthrie, not as some faultless idol but as a particular human being who used art to say something about society, and through that art, worked to change society for the better. In fact, Kaufman is dedicated to continuing Guthrie’s project today—he tours the classrooms and folk festivals of the United Kingdom, Ireland, and Europe with original presentations that combine musical performance and history, bringing Guthrie’s art and message to audiences that otherwise might never have been exposed to either. 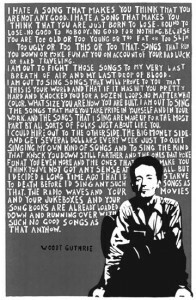 While arranged mostly chronologically, Woody Guthrie, American Radical groups its material into loose, thematic sections that correspond with phases in Guthrie’s political development. Kaufman begins with the context of Guthrie’s Oklahoma upbringing, pointing out that his oft-cited birthday, Bastille Day, is merely a coincidence; the year of his birth, 1912, is far more significant in that it marked the “near-zenith of the rising and falling tide of Oklahoma socialism,” the year when Eugene Debs’s Socialist Party won 16 percent of the vote statewide (compared to 6 percent nationally) (10). The socialist tradition in Oklahoma mixed populism with a dose of left-wing Christianity (The Grapes of Wrath’s preacher, Jim Casy, for instance) and drew much of its support from small farmers and immigrants. It was this milieu that initially shaped Guthrie’s independent and populist-minded radicalism, Kaufman suggests, and deeply influenced his later work—all presumably to the horror of Charley Guthrie, Woody’s father, a businessman and real estate speculator who wrote articles denouncing the local socialists. If mingling with prairie socialists, migrant workers, boxcar hobos, and members of the Communist Party nudged Guthrie toward radical politics, it was the outbreak of the Second World War that launched him into ardent antifascism. In many ways, the war was a pivotal moment in Guthrie’s evolution, and it serves as a sort of narrative hinge for the book. Before the war, Guthrie, like many radicals, regarded a conflict between nations as a conflict between those nations’ bosses, one in which the workers of the world had no stake. The early recordings of the Almanac Singers, the group he formed with Seeger and others, promoted this antiwar position. But Hitler’s invasion of the Soviet Union, the sinking of the U.S.S. Reuben James, and the bombing of Pearl Harbor pushed Guthrie—along with the Communist Party USA and much of the U.S. left—to give full support to what he regarded as a war against fascism. Guthrie was not shy about owning up to this abrupt about-face in his attitude toward the war. As he put it, “The world ain’t all good or all bad, things happen fast, and change around….Wars break out and folks are first on one side, then on another, because they believe in something, because they hate something…and gradually, out of all our isms, new isms, and new songs grow like weeds and flowers” (83). True, Guthrie was following the party line, but he also believed that one’s politics need to change with changing conditions and adapt to the class struggle as it plays out in the lives of actual human beings. The “New Situation” (as he termed it in a song) required a new stance, not blind adherence to some rigid orthodoxy. And that meant new songs. Whether with the Almanac Singers or alone, Guthrie wrote feverishly, and he considered every pen stroke and strummed chord part of the fight to smash fascism (at this time, he famously pasted a label to his guitar that read, “This Machine Kills Fascists”). Guthrie was deeply shaken by Nazi atrocities and haunted by a vision of his loved ones in chains, or worse. As he wrote to his second wife, the dancer Marjorie Mazia (who was Jewish), his antifascism was motivated by “a personal hate so strong that it makes you want to kill in order to keep the people you love from being slaves…because if you really love anybody or anything or any principle or any science or belief, you will hate, hate, hate, and keep hating anybody or anything that tries to hurt, or kill or destroy that which you love. Unless love has got this hate, it’s not love at all, it’s a cave full of mysticism, and one of the most dangerous forms of cowardice” (96). Ricardo Levins Morales is a labor and social movement artist/activist. His work can be seen at his Web site, Art for Social Justice, www.rlmarts.com. Used with permission. Guthrie’s extreme passion began to show in songs that glorified the killing of enemy soldiers and even the bombing of enemy cities—a sort of glee that is off-putting from this distance, in full historical view of the sheer human wreckage of the Second World War. His songs captured the brutality of the war but in a way that was largely uncritical of the entire war-making enterprise. At the root of this development was a change in how Guthrie viewed the state itself: whereas he once wrote dismissively about Franklin Roosevelt and the New Deal, for example, he was now singing praises to the triumvirate of FDR, Churchill, and Stalin. In fact, Kaufman suggests that this shift is visible in alterations to the songs Guthrie wrote about the Bonneville Power Administration for the Department of the Interior. In a 1941 version of the song, “Talking Columbia,” Guthrie sang: “Well, the folks need houses and stuff to eat,/And the folks need metals and the folks need wheat./Folks need water and power dams,/And folks need people and the people need the land” (64). But by “circa 1947,” after the war, Guthrie had substituted “folks” with “Uncle Sam,” shifting the focus from the needs of the people to the needs of the state, and effectively blurring the distinction between the two. This was an expression of Popular Front politics just as much as it was a result of Guthrie’s own changing views, but it gets to the heart of his full-throated support for the war effort, even in its most cruel and violent expressions. Regardless, Guthrie believed that the first task of the artist—musical or otherwise—was to “root out, expose, and kill out the fascist enemy everywhere, at home and abroad” (93). He took this seriously enough to enlist, and ended up in the Merchant Marine, where his ship was torpedoed twice, and he was once “at the receiving end of a punch in the nose from a right-wing shipmate for shouting, ‘God bless the Red Army!’” (102). Other than that, Guthrie experienced no direct combat with fascists; his main—and lasting—contribution to the fight was through his music. Kaufman argues that Guthrie’s antifascism was not limited to the war effort but part of a broader social perspective that saw an emerging “Union world” of equality and solidarity pitted against the fascists everywhere—whether in Nazi uniforms or KKK sheets, breaking strikes or leading lynch mobs. For Guthrie, then, antiracism was inextricably linked to the fight against capitalism, and throughout his career, he made the connection between the two explicit. Like many whites from the same background, Guthrie was casually racist as a young man, and sometimes performed degrading minstrel songs during his early years on the radio. After receiving a polite but stern letter from an insulted black listener, however, he rejected this poisonous consciousness and became an outspoken opponent of bigotry and white supremacy, championing black artists like Huddie “Lead Belly” Ledbetter and writing topical songs about grievous cases of racial injustice. Once, after a show in Baltimore with Sonny Terry and Brownie McGhee, Guthrie’s co-performers were asked to eat in the kitchen—Guthrie, enraged, began to trash the place, and was led out, yelling that the war against fascism needed to start at home. Not long after, Guthrie came face-to-face with the homegrown fascists of New York state’s Westchester County, while standing in solidarity with Paul Robeson during the Peekskill Riots. He was shaken, but those events confirmed what he already believed: that the war may have ended but it was still too soon to peel the antifascist label off his guitar. 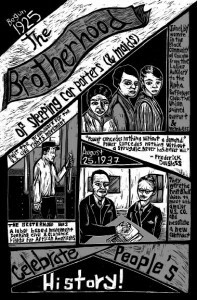 Meredith Stern, creator of this illustration, is one of eighty artists who produced over one hundred posters for Celebrate People’s History (Feminist Press, 2010), a book commemorating great events, activists, and acts of resistance. Edited by Josh MacPhee, member of the Brooklyn-based Justseeds Artists’ Cooperative (justseeds.org). Used by permission. In the end, the twin demons of McCarthyism and Huntington’s Disease slowed Guthrie’s output, and as the Popular Front was replaced by the witch hunt, Guthrie’s physical deterioration made it more difficult—and finally impossible—to play. Kaufman does not linger on these years, but describes how Guthrie’s songs and persona were transmitted to the folk revival of the 1960s by artists like Ramblin’ Jack Elliott and Bob Dylan. In many ways, it is Dylan who is most representative of how Woody Guthrie was metabolized by popular culture: Dylan, after all, adopted some shallow version of Guthrie’s persona (complete with the involuntary tics of late-stage Huntington’s, much to the horror of those who recognized them) and eventually turned away from the politically committed core of the music. It is a telling comparison: Dylan would reject what he infamously called “finger-pointing songs,” whereas Guthrie considered these songs the very lifeblood of his work. When a woman once asked Guthrie why he did not sing for free when it was for a “good cause,” Guthrie replied, “Lady, I don’t sing for bad causes” (119). The cause was the point. In a more unjust world, Woody Guthrie might have succumbed to this Dylanization: his legacy would have been a transmutable aesthetic category, as easy to apply or remove as a guitar capo, emptied of political content and ripped from its particular historical context (or perhaps invested with another, romanticized, one). That is how Guthrie is for many, a kind of hillbilly Jack Kerouac, wandering the nation’s highways and singing about dams and hobos and all the wonders of “this land” that was “made for you and me.” But thankfully, the collective consciousness of the radical movement has not forgotten what Guthrie stood for, and countless musicians—working in folk, country, punk, metal, hip-hop, and all kinds of amalgamations thereof—continue to build links on the great cultural chain of which Guthrie is just one part, although a significant one. Hopefully, Will Kaufman’s book will help the rest of us remember what Guthrie meant when he insisted “this land is your land”: not praise for the state but love for the people; not an empty declaration of patriotism but a warning—indeed a threat—to all the bosses and fascists out there who would deny our collective aspirations. I suspect that this is what Pete Seeger and Bruce Springsteen were getting at during the inauguration concert, and if there has ever been a more audacious display of speaking truth to power, as the saying goes, this one must be a close second. On that day, they sang one of the greatest red songs by one of the greatest red songwriters this country has ever produced, literally to the faces of the ruling elite and in the very heart of empire, for millions of people to hear. Woody would have loved it.